Qaffaal joined the yard in September 2014 from Goffs Sales. Purchased as a jumper, he made his first racecourse appearance in a junior 'bumper' at Newcastle where he finished fifth. It was clear that he had the speed for the flat and he raced on the level in 2015, his first victory coming in the 'Somerset Cheddar Handicap' over seven furlongs at Thirsk in July off a mark of 60. It was on the all weather that Qaffaal would come into his own, first winning on the sand at Wolverhampton in April 2016. Back on the turf he won at Musselburgh before hitting form at the end of the season when he ran off an all-weather hat-trick of wins, scoring firstly at Newcastle and then twice at Chelmsford. Qaffaal loved the surface at Chelmsford City and his final two victories would come at the Essex track. His form at Chelmsford was astounding, winning three times with two seconds and three thirds from 11 visits. He was probably a stone better horse at Chelmsford than anywhere else. A firm favourite with the staff, he particularly had captured the heart of head lad Mark Cobb. He was a horse who didn't have a bad bone in his body, always impeccably behaved and a flagship for the yard. Qaffaal's final race came at Wolverhampton in March 2019, finishing fourth in the Lincoln Trial at Wolverhampton, and receiving a Racing Post rating of 97, the second highest in his 47 race career. It was just a few days later that Qaffaal's career was to be cut tragically short. 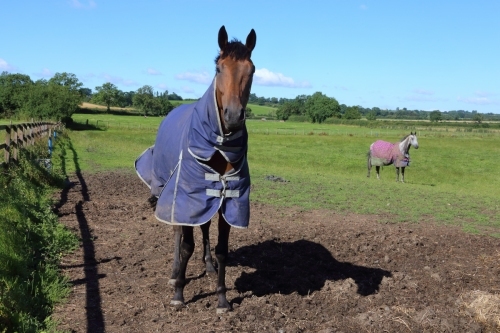 After a morning canter up the hill, a canter he would do each morning whilst in training, he suffered a heart attack whilst walking back to the yard. A gentleman to the end, he went down gently, giving rider Serena Brotherton chance to get off safely, before taking his final breath. A character who will be sadly missed, Qaffaal signed off with eight career wins, 14 places and almost £90,000 in prizemoney. Rest in Peace old lad.